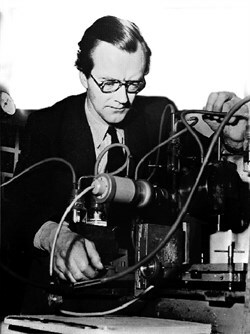 Maurice Wilkins was born in Pongaroa, 60km east of Pahiatua in the northern Wairarapa, on 15 December, 1916. At the age of six, he moved with his family to England and was educated at King Edward's School, Birmingham. He studied physics at St John's College, Cambridge, taking his degree in 1938. During the Second World War, Maurice investigated problems related to the separation of uranium isotopes as part of the Manhattan Project. But, after the war, moved to King's College where he began spectroscopic studies on nucleic acids, which eventually led to the use of X-ray crystallography to define the Watson-Crick model of DNA. For this work, he was awarded the Nobel Prize in 1962. Maurice married Patricia Ann Chidgey in 1959 and they had two sons and two daughters. After Maurice’s death in October, 2004, his family generously agreed to continue his memory by allowing us to rename The Centre for Molecular Biodiscovery, The Maurice Wilkins Centre. Maurice’s name was chosen not just to honour an accomplished scientist, but to send a message to all New Zealanders that coming from humble beginnings doesn’t preclude you from making one of the greatest scientific discoveries of mankind. We are extremely proud of our association with the name and family of Maurice Wilkins.